I love, love, loooooooooove comfort food. Homemade mac-and-cheese, lasagna, meatloaf, mashed po-taters, apple cake, PB brownies, banana bread; the list goes on. 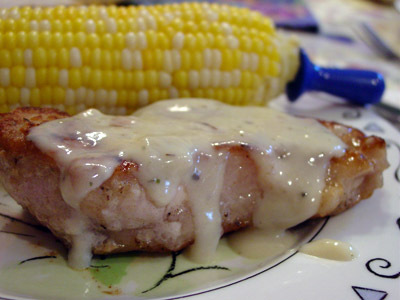 So pork chops with country gravy are right up my alley. Here, boneless pork chops are lightly coated in seasoned flour, pan-seared until golden brown, and then topped herbed gravy. I served them up with oven-roasted corn on the cob and freshly-baked dinner rolls. Could things be more delicious? Or simple? Or wonderful? It’s even a Cooking Light recipe. But the beauty is that it tastes like it came from the depths of Paula Deen’s butter-rich kitchen. Place flour, salt, dried marjoram, dried thyme, and dried rubbed sage in a shallow dish. Dredge pork in flour mixture, turning to coat; shake off excess. Reserve remaining flour mixture. Melt butter in a large nonstick skillet coated with cooking spray over medium heat. Add pork to pan; cook on each side until browned, about 3 minutes. Reduce heat, and cook for 10 minutes or until done, turning pork once. Remove pork from pan; keep warm.